Many adult Nigerians without formal education would say age and family responsibilities discourage them from starting studying and any form of schooling. But Bala Magaji, 45, a father of seven who on Saturday graduated in Islamic Studies, has challenged that claim. 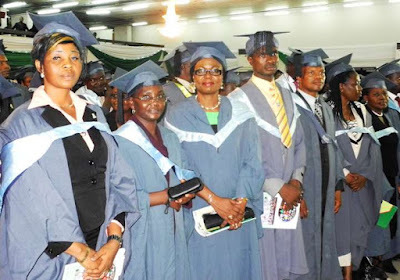 8th convocation ceremony of the university in Abuja on Saturday, said a university degree is not cheap or easy but can open doors to great benefits. Mr Magaji recorded a Cumulative Grade Point Average of 4.8. He advised the management of the university to start a postgraduate degree in courses they are yet to have the programme. ”I will like to teach Islamic studies later,” he said. Mr Magaji currently works at Unity Bank and he has a previous degree in Zoology from the University of Jos and a Masters degree in Banking and Finance from Bayero University, Kano. ”The three programmes that got interim accreditation are B.sc Hotel and Catering Management, B.sc Political Science and B.sc Chemistry,” he said.